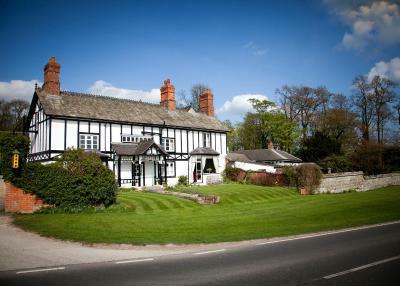 Lock in a great price for Donington Park Farmhouse Hotel – rated 8.7 by recent guests! Good Bathroom with nice large walk in shower. Big, comfortable double bed. Great location and really friendly welcome. Nice meal in the restaurant in the evening and a good hearty breakfast with plenty of choice. We were at a Track Day at Donnington the following day so a perfect location and well looked after. The rooms were a little 'tired' but all clean, comfortable and everything worked. Great for the night on the budget we'd set and perfect location. All the staff were super friendly and eager to please. Good job. - The location was excellent for access to Donnington Park racetrack. - The staff were friendly. - The room was clean and tidy on our arrival. - The hotel was easy to find when we arrived at night. - The bar was open late for a drink on our arrival at 10pm. Second stay excellent rooms friendly and professional staff helpful as always. didn't see any croissants? The bed pillows were like sleeping on bricks!!!! Kept me awake!!! So hard! The views and location was perfect for what we required. Room was very clean and comfortable!! Cooked breakfast was served hot and thoroughly recommended! Prachtig gelegen in het groen, onder de rook van de luchthaven, maar uiterst aangenaam en rustig. De voorste kamers hebben een prachtig zicht op de groene velden, en een kasteel in de verte. 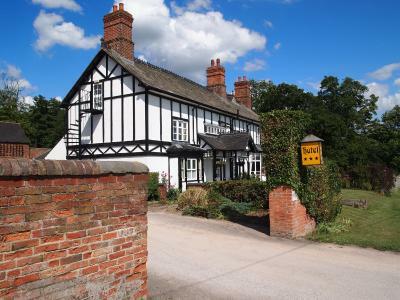 Donington Park Farmhouse Hotel This rating is a reflection of how the property compares to the industry standard when it comes to price, facilities and services available. It's based on a self-evaluation by the property. Use this rating to help choose your stay! 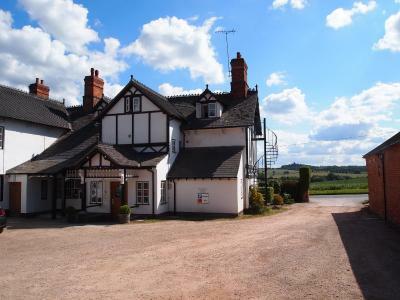 Located next to Donington Park, Donington Park Farmhouse Hotel features a private walk-way into the Pits and Paddock entrance of Donington Park Race Circuit. Free Wi-Fi is available on site. Rooms combine original 18th Century features with modern facilities. The room features a TV with Freeview channels and tea/coffee making facilities. Many rooms have a view across Breedon Hill and the surrounding countryside. The hotel's breakfast and dinner menu features local produce including Venison from it's own Deer Park and Beef from it's own Farm. The bar features over 40 Malt Whiskeys. The Hotel holds a Green Tourism Silver award and in 2013 won North-West Leicestershire's 'Green Footprints' Award, as the Greenest Business in the district. Initiatives include Carbon-neutral Biomass Heating System, Natural Reed-Bed Waste Management, extensive Recycling and PV Solar Panels. 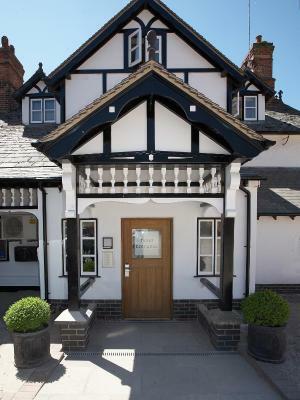 The hotel is a 5 minutes' drive from East Midlands Airport, the M1, A50 and A42. 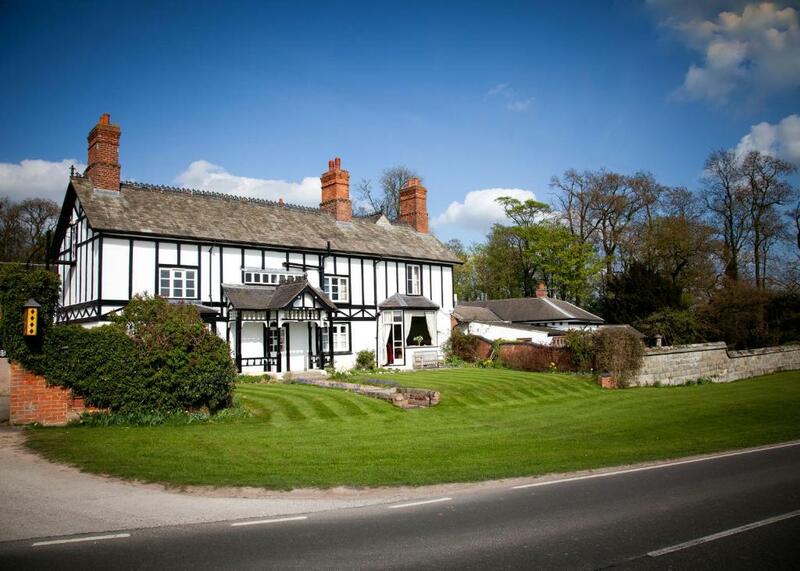 When would you like to stay at Donington Park Farmhouse Hotel? 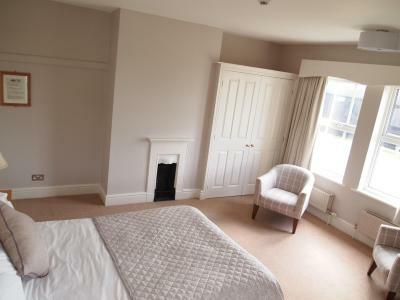 Located either in the main hotel building or in a building 100 yards into the grounds, this comfortable character room is on the first or ground floor. With a double or queen-size bed or 2 single beds, it features free Wi-Fi, a flat-screen Freeview TV and tea and coffee making facilities, as well as en suite shower or bathroom with hairdryer. 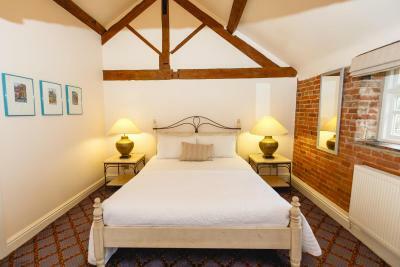 Located either in the main hotel building or in a building 100 yards into the grounds, this comfortable character room is on the first or ground floor. With a double or queen-size bed, it features free Wi-Fi, a flat-screen Freeview TV and tea and coffee making facilities, as well as en suite shower or bathroom with hairdryer. Thanks for choosing Donington Park Farmhouse Hotel! We're a family business, committed to growing healthy, happy and long-term relationships with our customers, employees, suppliers and environment. We have recently been awarded a certificate of excellence in green credentials by the District Council. This award recognises our biomass boiler (which uses timber grown on-site), our natural sewage treatment system, our PV solar panels and our commitment to using local suppliers. House Rules Donington Park Farmhouse Hotel takes special requests – add in the next step! Donington Park Farmhouse Hotel accepts these cards and reserves the right to temporarily hold an amount prior to arrival. - There was a wedding on in the barn, which was very loud and kept us awake past midnight. - There was a loud kitchen extract vent just outside our bedroom that was very noisy in the morning. - The price of the hotel was very expensive for the facilities and amenities on offer. - The double bed was very small. - Our room was neat when we arrived, but was not refreshed/tea & coffee replenished/etc. during our 2 night stay. - While the breakfast was improved on the second morning, it was not very nice on the first morning of our stay (overcooked eggs, poor coffee, etc). - The bedroom was stuffy with only one small window, while the bathroom had no external window. Disturbed by Reception door banging too as we were in a downstairs room but mentioned to staff on leaving. I am sure this issue will be rectified. Room was a little stuffy.